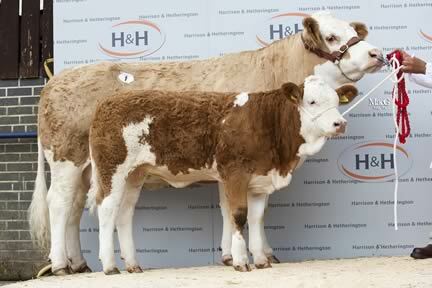 The best Simmental genetics from Suffolk in the South to Morayshire in the North will be converging on Harrison & Hetherington’s Borderway Mart. This year’s show and sale on Saturday September 14 boasts an entry of sixteen maiden and seven served heifers, all of which had to show above breed average estimated breeding values (EBVs) to qualify for the event. Originally from Switzerland’s Simmen Valley, the Simmental has been bred in the UK for almost four decades and is now one of the country’s top beef breeds. Popular for its fast growth rates and low input requirements, the Simmental is an outstanding suckler cow known for its fertility, docile nature and hardiness. Now the most numerous cattle across Europe, the Simmental are bred on all five continents and have a worldwide population of 41 million. Harrison & Hetherington’s Sales Director Scott Donaldson is looking forward to another sale of females to match the quality of Chadston Tollie’s Delight VI, last year’s top priced heifer sold for 13,000gns with her calf at foot to Hunnyhill Farms, Newport, on the Isle of Wight. Leading Ladies Simmental sale on Saturday September 14 will also coincide with a sale of 239 pedigree Limousin cattle, which includes the dispersal of JR McKeen’s Hartlaw Herd, and production cattle from the Normande, Glenrock, Rentons, Harveys, Ashmara and Millbrow herds.